For the last few years, the girls in the office have been trying to get the OK to set up a Bathroom plumbing scene garden in front of our office, since we are a plumbing company. 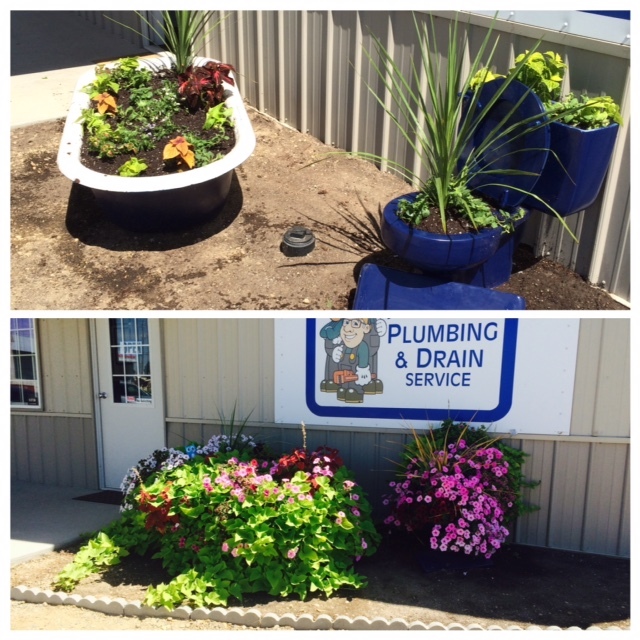 We finally got the approval, so Katie went searching and found the perfect tub and toilet, then painted them our color of Blue, and planted our Plumbing Fixture Garden with beautiful plants, flowers, and vines. We think our Bathroom Garden looks fantastic. With Spring finally here, we are really enjoying the touches of color and think this adds some more uniqueness to our Plumbing & Drain Company. We hope you will enjoy it also.